Alemu Tekewe Mogus is a PhD student at the Centre for Biomolecular Engineering, working to develop virus like particle-based vaccines for prevention of rotavirus-related infections. His research looks at the problems associated with the efficacy, quality, safety and cost of the existing oral live-attenuated rotavirus vaccines in developing countries, particularly in the Sub-Saharan Africa regions where there is high childhood mortality and morbidity due to rotavirus-related diarrhea. 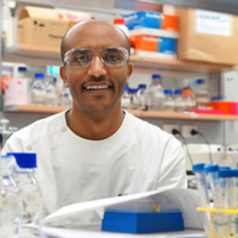 Mr Alemu's focus is to develop effective, safe and cheap virus like particle-based vaccines using a low cost and easily scalable microbial platform technology.